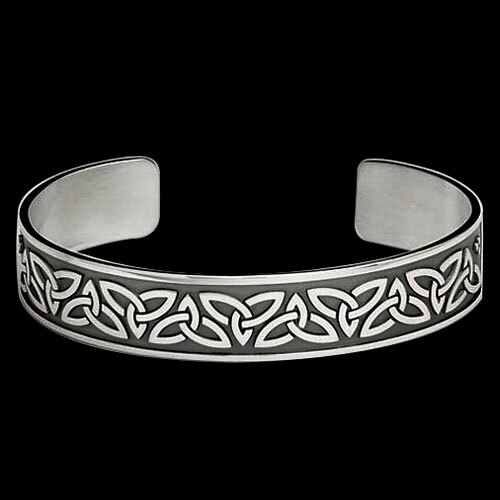 Sterling Silver Trinity Celtic Bracelet by Metal Arts Group. Mysterious and beautiful, the Trinity Knot is a continuous series of Celtic knots used to represent the Holy Trinity or honor the triple Goddesses of the Celts. While its true ancient meaning is a mystery, it is said that its design declared love and unity while representing inifintiy and enternity becasue the knots have no beginning or end. 6.5 x 0.6 inch Sterling Silver Trinity Celtic Bracelet by Cari Buziak. Made in USA.